In Section 7 we embrace the horse energy of playfulness. for men, wear playful socks, tie, handkerchief, watch, jewelry, etc. wear a playful hat, tutu, angel wings, all of the above, etc. color mandalas while attending meetings (this is my favorite idea). Contrary to popular belief (and yet scientifically proven) coloring/doodling while at meetings brings our creativity into play, making meetings more productive, giving us greater access to “outside the box” problem solving! 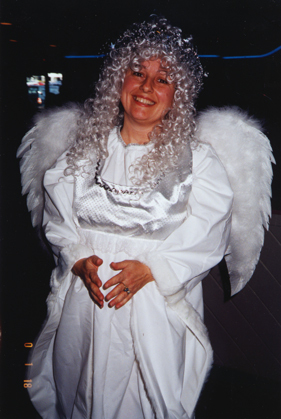 Wearing angel costume at work; gave a presentation that day. Very fun! Be sure to play as you color this month section. Be sure to download/color the July 2014 Mandala of the Month.